Since emerging at this year’s NCECA Conference, I feel a great relief, a quiet internalization of having addressed my peer group and presented my story. As a direct result of this public presentation I have been invited to demonstrate and speak at numerous schools and community art centers, and the added visibility has encouraged greater support and connoisseurship of both my work and research. The formal recognition by the NCECA board and committee provides value to my academic and studio endeavors, and the opportunity to present supported my assertion that I am a devoted member of the NCECA community willing to work and contribute to the creative grow of ceramic art and research to come. However, the most important impact of this award came to me as an unexpected private transformation. In preparation for the presentation and show, I found myself looking deep within, searching for the most accurate way to describe what I do. I found the clarity and focus I needed through my feelings for ceramics and personal history rather than objects and practice alone. 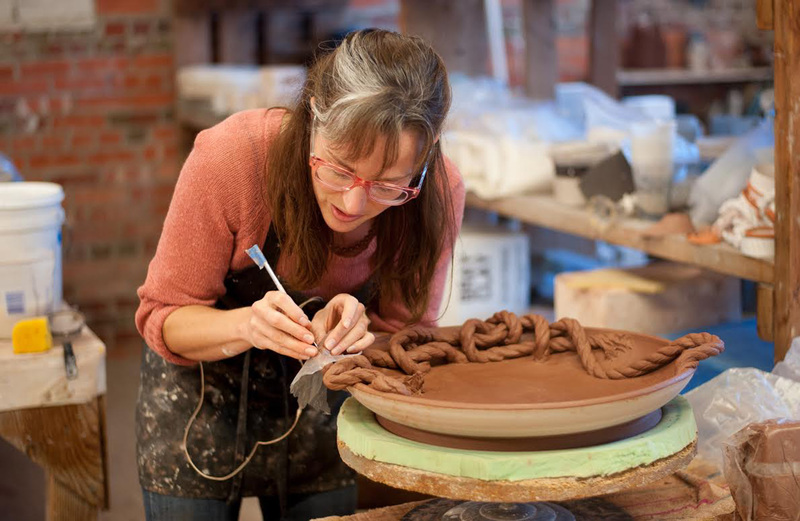 By retracing my own journey in clay, I was confronted with my strengths and weaknesses and realized that I had to speak candidly about this history in order to be most accurate about where my work comes from. Accepting vulnerability and having the fortitude to express this has been the most profound impact of having been an NCECA emerging artist. Thank you for allowing this public platform, and thank you for listening. Limited to 12-minutes at the conference, Brandl was kind enough to respond to some questions I recently posed to her via email correspondence. Her generosity of time and thoughtful response offer an opportunity to dig deeper into some of the decisions and motivations Brandl is exploring through her creative practice. JG: Why do you find the vessel such a compelling framework for sharing your stories? JB: I admire the vessel as a visual framework in all of its historical iterations, but the most potent attraction to this context has to do with my personal history and how it satisfies my sense of balance. The vessel is a fascinating object, the void interior defines the exterior, it can physically contain something but it can also hold images and subsequently display ideas and narrative as symbolic language. A vessel is a container, but its interpretation permits a multifaceted understanding of utility as literal, metaphor or both. My attraction is grounded in the overt utility that a vessel suggests; it permits a connection to my Midwestern upbringing that established the premise that an object should be useful. It was the identification with labor and its value, which gave craft and craftsmanship high praise in my childhood home. What I now identify as high art, was viewed with suspicion in its seemly functionlessness and reference to decadence and collected wealth. The logic of childhood was flawed; however, my desire to mediate past and present perceptions through an object locates me at the contextual humility of vessels and pots. The narrative vessels I construct are beyond practical utility in most ways but my adherence to the void interior and vestigial function permits me to use the language. The linguistic ties are as important as the literal context and form. While many viewers understand what a vessel is, the appearance of novel content situated within the context of a familiar utilitarian form can be a disruptive experience. By calling what I make a vessel, I have framed the comparative conversation. Vessels and pottery preserve a formal levity, which permits me to address culturally averse subject matter. JG: Could you share a little about how you see your work connected to that of other artists working with narrative content within and beyond those working in clay? Who and what are you looking at and gaining inspiration through? JB: I see my work as another iteration of a long and continuous human tradition of narration and communication. The telling of an epic or in my case an un-epic, with a cast of characters conveying something other and universal seems to be a part of human nature. Artists that work with clay and clay-like materials speak the most directly to me. I examine how they have managed to communicate and what those technical strategies are; lastly, I like to ask why they are clay and not something else. I have always been fascinated by the raw clay bison formed on the floor of a cave in France some 14,000 years ago, those figures exist right alongside representative drawings of animals, abstracted dots, and incised geometric patterns. An important part of my personal narrative investigates why I insist on clay. Looking at other humans that use clay I am able to gain a better perspective through comparison. Therefore, I am inspired by human experience, specifically as it is represented in mythology, literature, science, history, ecology, phycology and culture. I compress the visual richness of the centuries into my own ceramic vessels, forming a distillation of historic and personal symbolic language. Any visual or narrative similarities that my work possesses are the result of communal proximity informing my conscious and unconscious decisions. I do not worry as much as I once did about copying or nuance, I have a better understanding of myself as a unique person from a specific time and culture. Themes, material, and methodology are the stuff of generating narrative and symbolic language. Each individual is different, but as members of the same species quite similar; circumstances and luck take care of the rest. The National Council on Education for the Ceramic Art is immensely grateful to the Windgate Charitable Foundation for their support of NCECA’s Emerging Artists program from 2013-2017. Additional blog entries will appear on other 2017 recipients of the award before our 2018 cohort will be announced in the month leading up to the conference in Pittsburgh.